Business cash advances are a common way for businesses to get the money they need for their survival. If you need money for equipment purchases, working capital, or any other number of items, a cash advance can help. While business cash advances can be convenient, they are not free. In most cases, you will pay quite a bit for the funds that you need. Here are some things to consider on business cash advances and how much they will cost you. With business cash advances, you need some sort of consistent credit card transaction history. 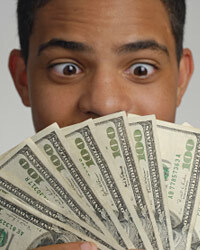 In order to do a cash advance, they will give you the money that you need and then alter your credit card machine. Every time you do a credit card transaction, part of the loan is repaid. In this manner, you can make payments only when you are getting sales. Therefore, it gives you added flexibility when you repay the loan. The costs of a merchant cash advance can be substantial compared to other loans. In some cases, with all of the fees, you may be paying as much as 200% APR. This type of loan is typically done for those that cannot qualify for traditional financing because of their credit. Therefore, you should be prepared to pay quite a bit for the money you need.